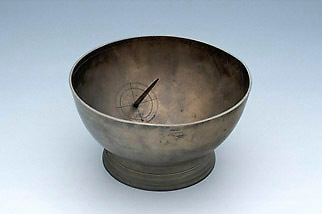 This scaphe dial, in the form of a large bowl, had at the bottom a compass which is now missing. The gnomon, which appears to be a modern replacement, is inclined for latitude 48?, as indicated by the inscription on the border of the scaphe 'POLVS GRA: 48'. The instrument is in brass and has traces of gilding on the inner surface.